Daniel Tiger's Neighborhood joins the weekday children's lineup on Rhode Island PBS beginning Monday, September 3rd at 6:30 A.M. This new animated series comes to PBS Kids from the Fred Rogers Company and brings together a group of today’s leading creators of children’s media and educational technology. Fred Rogers revolutionized children's media with Mister Rogers' Neighborhood, and Daniel Tiger's Neighborhood continues on this path of innovation, helping the next generation of young children learn and grow in new ways. The series is developed by the Fred Rogers Company with Angela Santomero, cofounder of Out of the Blue Enterprises and the creative force behind the PBS KIDS literacy series SUPER WHY! Daniel Tiger's Neighborhood tells its relatable stories using musical strategies grounded in Fred Rogers’ landmark curriculum, and its catchy songs give parents and children a concrete way to practice important social and emotional skills together. 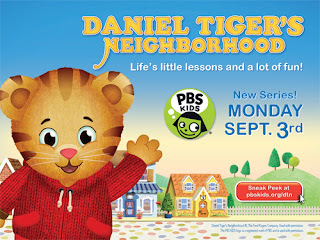 A vibrant animated series for preschoolers ages 2-4, Daniel Tiger's Neighborhood features the "children" of the original, beloved Neighborhood of Make-Believe characters from Mister Rogers' Neighborhood. The 4-year-old Daniel Tiger talks directly to his young audience, inviting them into his colorful world. Daniel is joined by his friends O the Owl, Katerina Kittycat, Prince Wednesday and Miss Elaina. Together, through imagination, creativity and music, they learn the key social skills necessary for school and for life. The series tells engaging stories about this curious preschooler and is accompanied by cross-platform games and activities for the very youngest children, together with online resources for parents and teachers. For other fun news and events, bookmark ripbs.org/kids and subscribe to the Club House Connection blog.